As a website owner (and digital marketer), could you apply the principles of neuromarketing to your online efforts? Do you know what neuromarketing is? Do you know how to apply the principles of neuromarketing to your website design and how to create landing pages that will generate more conversions? Learn the answers to those questions by reading the excellent articles that I found for you in this week’s #FridayFinds. Neuromarketing is a field of marketing that uses medical technologies such as fMRIs (functional magnetic resonance imaging) and EEGs (electroencephalography) to study the brain’s responses to marketing stimuli. By studying our brain’s responses to advertising and branding, marketers can adjust their messages to elicit better responses to their marketing efforts. Neuromarketing is not cheap. According to Marketing-Schools.org, “an fMRI machine can cost as much as $5 million (and twice that to set up). Additionally, a single ad sample group of 20 people can cost in excess of $10,000″. Remember the Pepsi Challenge? In 2004, neuroscientist Read Montague asked the question: “If people truly prefer Pepsi over Coke, why isn’t Pepsi dominating the market?” After publishing his findings, neuromarketing emerged. While I always strive to include current blog posts in this series, I strongly believe that some articles are “evergreen” and stand the test of time. So, (for those of you interested in learning more about neuromarketing), I recommend reading Neurofocus Uses Neuromarketing to Hack Your Brain which is based on an article that was first published in 2011 in FastCompany magazine. In his article, Adam L. Penenberg introduces us to A.K. Padeep, the founder and CEO of NeuroFocus, a science based consumer research company. This is an interesting read because it starts out explaining how this company collected data (from paid participants who wore portable wireless scanners) to analyze their subconscious responses to commercials, products, brands and messages. 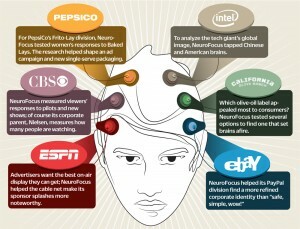 Some of the companies that use neuromarketing include: Pepsico, Intel, CBS, California Olive Ranch, ESPN and eBay . How Can You Apply Behavioral Psychology to Your Website Design? The article that intrigued me this week (and the one that motivated me to research neuromarketing) is 6 Neuromarketing Principles For Designing More Persuasive Websites by Tim Ash on MarketingLand.com. This quick read shares six techniques that you can apply to your website to create pages that will persuade your visitors to buy right away. As usual, I am not going to go into a lot of detail but instead I’ll leave you with these bullet points from Tim’s article and encourage you to read it for yourself. The screenshots that Tim includes illustrate how neuromarketing principles (based on using psychological behavior) are used by companies to create website pages that result in higher user engagement. Employ the “hurt & rescue” technique. Can NeuroScience Be Used to Increase Your Conversion Rates? Are you unhappy with your conversion rates on your website? As I was researching this article, I searched to see what has been written lately on this topic and I came across Nick Kolenda’s guest post The Neuroscience of Conversion Optimization on NeuroScienceMarketing.com. Nick’s post is written for digital marketers. In it, he shares three principles from neuroscience but he also cautions his readers that . . . Note: You won’t want to miss Nick’s summary where he bullet points his own article. Personally, I’ve bookmarked this article to keep in mind when I redesign my site. Note: After you finish reading this article, please check out my follow-up post Can You Influence Consumers by Using Neuromarketing Techniques? #FridayFinds to learn more. Since writing this, I’ve found more great resources including the SlideShare presentation “33 Lessons in Neuromarketing” (which features the finding from four leading experts). You can follow this week’s featured authors here: Adam L. Penenberg (on Twitter), Tim Ash (on Twitter) Nick Kolenda (Google+), and me (Sherryl Perry) on Google+ or Twitter. That’s an interesting read Geoff. Thanks for sharing it. Thanks for sharing it and for letting me know that you enjoyed this post. Since I started researching this topic, I’ve been following the hashtag #neuromarketing. There’s a lot of great info available on this topic. I believe when I see “Only 5 products left” or “24 hrs remaining” it drives me crazy and most of the time I opt for the product. It’s impossible to keep up with everything! That’s why we need to help each other learn. I have a few products that I purchased early on in blogging career (including banners and other graphics). Bloggers who I respected were praising them and I clicked. Most of them, I’ve never used. (Maybe some day I’ll find a use for them.) Now, I always ask myself does this particular product fit what I am trying to project or does it fit into a specific strategy or tactic that I plan on implementing. Interesting topic. Our unconscious mind not our conscious mind, drives how we respond to ads, brands and products and ultimately, drives all our buying decisions. Customers don’t really know why they buy, what to buy, which is why traditional market research fall short. That’s the idea goes. Keep posting more interesting topics. It’s nice to meet you here. Thanks for letting me know that you like my blog. I try my best to share info about SEO, social media and marketing trends. Although none of us here can afford to invest in something like neuromarketing, we can certainly pick up some tips from the companies that do. Sherryl- I have heard of Neuromarketing. This has been a round for years. I remember reading articles that Microsoft and Disney and Google have use this technology with their advertising and marketing campaigns. If you have the money it saves you time trying to figure out what works and what doesn’t work. If it was something we all could afford it would help figure out the human emotion when it came to customer’s behavior when purchasing. It’s good to hear from someone else who’s familiar with neuromarketing. I honestly had not heard of the term before I came across Tim’s article. Honestly, I expected to find a simple definition that I could share, touch upon Tim’s post and then move on to another topic. Little did I know that the more I researched it, the more interesting I found it. I have a feeling that we’re going to be seeing more posts on this with other ways that we can apply it in simple ways to our websites. As always, thanks for dropping by. I hope you have a chance to celebrate the Labor Day weekend. We learned a bit about this in graduate school. It’s interesting because it’s happening all around us all of the time now. For example, watch a Dancing With Stars or any of those type of shows and what are the judges drinking? A Coke with their signature red shaped cup and logo always showing. Or, what about in the moves. What was Rober Downey Jr driving throughout Iron Man. Audi’s. Those are all paid advertisements. Now the question is how do we get others to use this on their sites as a way to incentive their readers to identify with us without feeling like they are being advertised to. I think it’s much harder to do one type of company in a particular genre than maybe another. It’s easier in videos if people can see us use the tool than in really any other format in my opinion. Loved the ideas Sherryl!!!!! This is definitely something to really think deeply about and come up with a strategy around. It definitely is challenge right now. I hope you have an amazing holiday weekend! Don Purdum recently posted..Are You Flailing Around Trying To Build A Business Online Or Are You Actively Building a Community That Will Help You Do It? Both Tim Ash and Nick Kolenda had useful examples of how we can incorporate neuromarketing into our websites. Now that you’ve mentioned product placement, I’m going to start paying more attention to visual media (like photography and video) to see if I can spot signs of neuromarketing there too. I’m sure we’ll start spotting it more often if we have it in the back of our minds. Thanks for weighing in on this. It’s good to hear from someone else who was already familiar with it. I find it a fascinating topic and now that I’m following the hashtag on Twitter, I expect to find more share worthy content. I hope you have an amazing holiday weekend too Don. It looks like the weather will be great here too. Thanks so much for this article. Neruomarketing is fascinating to say the least. I headed over to read the article by Tim Ash. It makes perfect sense and now that I am aware, I started thinking of all the places online that I have encountered some of these methods. I will definitely research this further and see how can I incorporate this to fit some of what I do. Thanks so much for bring a fresh perspective to marketing! Thanks for letting me know that you found my article helpful The examples that Tim Ash included really resonated with me. I know for a fact that I’ve made quick buy-now decisions based on the (perceived) lack of inventory. Neuroscience and neuromarketing are topics that I think we are going to be hearing a lot more about – especially as to how they relate to small business owners. I’m keeping my eyes open for more info on this subject. So, you may be hearing more on this from me. Of course, I’ll be keeping an eye out for other new topics that will be interesting and hopefully beneficial to myself and other bloggers as well. Nice to see you here and thanks for taking the time to weigh in on this. I am so surprised to read this post. I was not even aware about such type of techniques which are used my marketers. Is it possible to know the activities of a human brain? How can marketers do it? I mean is it that much easy? Marketer connect with the their customers after knowing what they want and how they can act for their message. Hope to learn more about Neuromarketing. Neuromarketing was new to me too. I knew that large companies invested millions in consumer research but I can’t remember reading about neuroscience before. It’s quite interesting. What I found the most interesting is how we can apply tactics like scarcity and decoys to landing pages on our websites. There definitely is a lot to learn about it. One of the things that resulted from this article is that I now have quite a few new Twitter followers who tweet about #neuromarketing. (I’m them back of course.) You know if I find more articles on this topic that I will definitely revisit it. Thanks so much for dropping by and weighing in on this. It’s helpful to know what readers find interesting here. A very unique post with quite awesome info that is sufficient to help marketers exploit a new way to influence their online buyers. I think every activity with two-communications has mind at focal point. Both of them try to deal with each other’s mind. That is why is right called the real power is mind power. A good marketer should also know the basics of psychology because his ultimately aim is to influence the audience and for this he has to know full what his audience thinks, what it wants and how it will react. The concept of neuromarketing is still quite uncommon and there is need to take steps to further promote this wonderful idea to achieve one of the important marketing goals. Thanks a lot for sharing quite useful post offering huge info for all online marketers also to apply it for their online success. Mi Muba recently posted..How to find serious online buyers in a crowd? Thanks for the kind words! I’m glad you found my article helpful. Tim’s post piqued my interest. Once I started my research, it was a real eye opener. We see these tactics in action as consumers but to read how we can incorporate some of these methods into our websites is interesting. Nick’s article is helpful as well. Something that I didn’t expect is that my post has been picked up by a lot of folks on Twitter who blog about neuromarketing. A few have followed me and I’ve followed several of them myself. If anyone’s interested, they can search for #neuromarketing. Great to see you here! Thanks for taking the time to add your insight to the conversation. I must say that I am becoming a casual visitor of your blog because of your awesome work for your readers, thanks for that. Moreover, I am hearing the term “neuromarketing” the first time ever in my blogging even whole life but now I am confident that after reading this article I can extract huge benefit from this trick. You’re welcome and thank you for the kind words. It’s always nice hearing from readers. Neuromarketing was a new term to me too. The more I researched it, the more I became interested in it. While the first few resources that I linked too are educational, I believe the real value to us as bloggers lies in Tim Ash and Nick Kolenda’s posts. Good luck with it! I hope all of us can find some ideas that we can implement on our websites. I’ve not heard the term “neuromarketing” but I have recognized some of what they’re sharing that we should be putting into our marketing. I guess maybe no one really defined that explanation of that before but it makes perfect sense. I have to agree, that’s a lot of money to invest to learn this but if that ends up bringing them more revenue down the road, which of course they can afford, then it would be worth it to them. Now we would be idiots to ignore their findings and not at least test them out ourselves to see if this can benefit us in any way. I’ll have to read Tim’s post mostly because I’m just curious now. I’m not a copywriter so I’m not sure how well I can do a sales page justice but I’m going to give it a whirl. Thanks for this share, you always find the most interesting stuff. That term was new to me too. I thought I would get a quick definition, share the Reader’s Digest version and then get right into the article by Tim Ash. To my surprise, I found it to be a fascinating topic. Tim’s post is great. I love his use of screenshots to reinforce his examples. Nick Kolenda’s article is helpful too. He takes a look at three principles of neuromarketing and then offers suggestions on how to apply them to our sites. I’m glad you liked my post. Enjoy your week too! I love the topic of neuromarketing! So much so, I have been studying it for quite a while now. Not for my blog, but for marketing purposes. It just fascinates me! Now, when I watch TV, I look for the certain things they put in there using neuromarketing. I’m getting kind of obsessed with it only because it is one of my interests. I walk into a store, and they have little screens along the isles to market something. I used to find them annoying, but now I study them lol. Once you start understanding the art of neuromarketing, you see it everywhere! So, If the big boys are doing it, we, as marketers need to be in the know! I must say I did apply it to some of my marketing ads and my findings were that it worked better than when I didn’t. You’re the first one here to say that you’ve been studying neuromarketing. I find it fascinating as well but until I read Tim Ash’s article, I knew little about it. It didn’t take me long before I realized it was a topic that I needed to research and write about! It’s great that you look for it in stores. I’ll have to start doing that myself. I’m sure it works on me. I’m the first one to go into Kohl’s with a 30% off coupon (when they’re also running their $10 Kohl’s cash promotion). Then, I return in time to redeem the cash and combine it with my 30% off). I know they’re playing me to a degree but the deals that I get are amazing. One habit that I’m trying to break is fast-forwarding through commercials. When, I pause long enough to watch them, there’s a lot to be learned there too. Thanks so much for letting us know that applying neuromarketing principles to your marketing ads work. I’m sure there are many readers here who will benefit from knowing that! I feel if the big money is backing it and using it, neuromarketing probably works well. Sure they’re off here and there, and it may be a bit more of a numbers game for them, but people keep visiting espn, buying Pepsi and watching CBS. Even if no brand dominates the world market per se – Pepsi versus Coke – there’s much to be said for studying how we work, and simply persuading based on these studies. The brain functions in a certain way. Learning this way of functioning helps marketers tailor their message, to influence buyers. So much of what we do – heck pretty much everything we do – happens beneath the surface. We act on a subconscious level. The brain reacts, and we make an impulse buy. While I read this post Sherryl, I tasted Pepsi, and I thought of CBS’ Friday night lineup from New Jersey….and I haven’t watched CBS on Friday in NJ since the first week of January….having been in Thailand and Fiji for the past 8 months. Whether it’s neuro or not, I can’t say, but I have a feel certain neural pathways in my brain have been carved out due to some clever, emotion-inducing marketing by these heavies. They always say “follow the money”. So, it makes sense that this is worth paying attention to. Realistically, I don’t believe I personally know anyone with deep enough pockets to even consider investing in anything like this but we can certainly get inspiration from understanding what companies like Pepsi and CBS are doing. Tim Ash’s examples and Nick Kolenda’s explanations of why neuromarketing works and how to apply it are great. I’ve bookmarked both articles to refer to. I can picture you drinking Pepsi and thinking about CBS’ Friday night lineup! 🙂 It must feel strange being back in NJ after being in Thailand and Fiji for so long. Are you staying in the US for a while or do you have another trip planned soon? Actually Sherryl I’m still in Savusavu, Fiji 😉 We’re here for 2 more months to the day, then Bali for a month, then NJ….oh yes we love seeing fam and friends, but it gets a bit weird….after 1-2 months, itching to return to warm weather. I won’t be investing in it any time soon either Shaan. 🙂 We can be copycats though and follow the lead some of these companies are taking. I found Tim Ash’s examples inspiring. 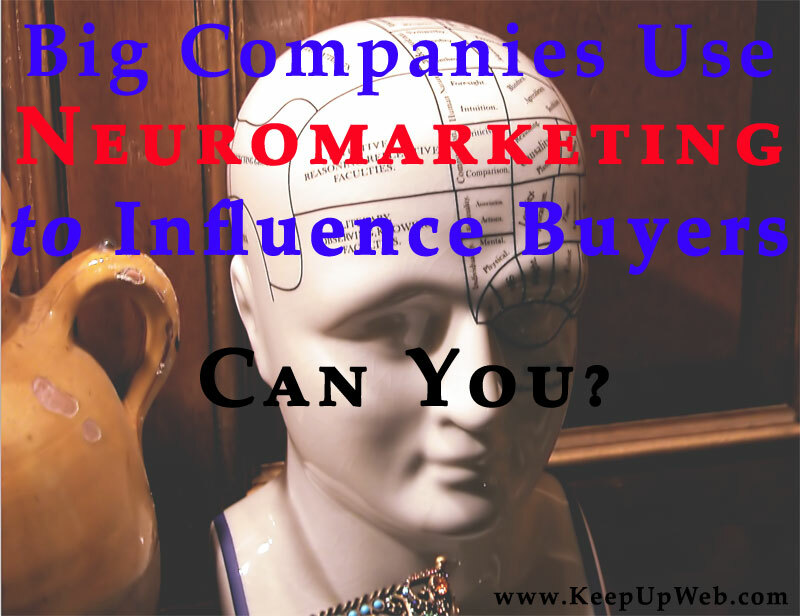 Sherryl — this was an eye-opening post, and I didn’t know the term neuromarketing. I’m about to embark on a redesign of my website so I was particularly interested in reading the article about using neuromarketing principles in designing a website. I recognized all of the examples because they are so common in marketing, but the strategies are fascinating. I must admit that I’ve “fallen” for some these myself (and who hasn’t?). I don’t know how many I can apply to my website as I don’t sell a product. But the article has given me some ideas about how to rewrite some of the content. Thanks for introducing me to an important subject I hadn’t known about. Thanks for letting me know that you found this helpful. I admit that at first, I thought how come I haven’t heard about neuromarketing before? Then, as I read it, I realized that I have seen many of these strategies in use before but I didn’t understand the science behind it. I’m not sure how to apply this to a service. either but I think we can get creative and both come up with something. While it was Tim Ash’s post that drew my attention to this topic, it’s Nick Kolenda’s “How to Apply It” technique that really has the wheels turning. As always, thanks so much for dropping by and kicking off the comments too.